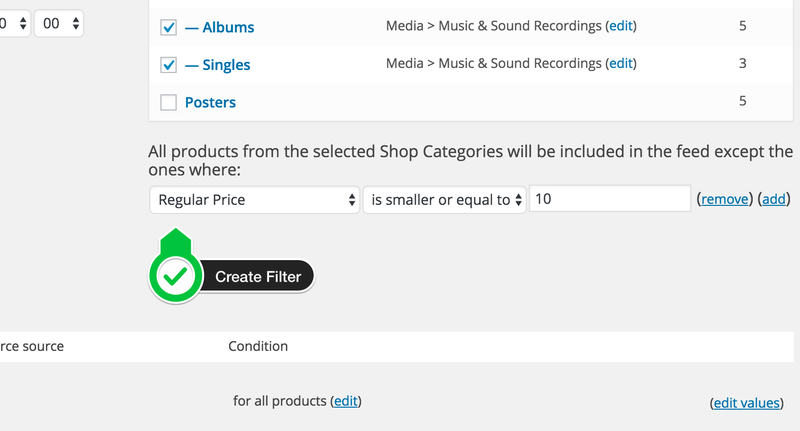 As off version 0.31.0 from our wp product feed manager and version 0.18.0 of the Woocommerce Google feed manager we have added advanced filter options. It will make it possible to exclude product from your product feeds. Before, you could exclude and include products only by selecting the right category under “Category Mapping” This is not always right because you may have categories where you don’t want to include all product. There are many situations where you would like to be able to exclude certain product from your feed. For instance you would like to exclude seasonal products, unprofitable products, products out of stock and not available. Let’s take a look at the new filter options where to find them and how they work. Let say we have products with low price in one category where CPA will exceed gross margin. So we want to exclude products under 10 bugs in the Music category. When we click this button we get af familiar setup we also find under Condition with the attribute mapping. That’s how easy it is to use. Take an other look at the video for a walk through.